Congratulations on completing the crossword puzzle! Below is the answer key. Scroll down to view marketing ideas related to the words in the puzzle. Write questions for expert / fact witnesses. Assist with fact witness preparation. Attend depositions as requested. Summarize deposition transcripts. Legal document by expert stating the claim has merit. Assist law firm staff and expert witnesses in creation of affidavit. TRIAL Process in which evidence is presented by Plaintiff and Defense to a judge and jury. Prepare summary reports for use in trial notebooks. Create PowerPoint presentations for use at trial opening and/or closing. Coordinate and prepare experts. Draft cross examination questions for medical experts. Attend trial as requested. A specialist in a particular field who presents an opinion at deposition and / or trial. Person who initiates court action against another party. Educate plaintiff about litigation process. Serve as liaison to plaintiff for medical matters. Assist with preparation of plaintiff prior to deposition. Period between filing of lawsuit and trial; used for fact finding. Draft discovery requests and responses. Process to resolve dispute without going to court; facilitator hears evidence and decides outcome. Prepare summary reports for use in arbitration notebooks. Prepare PowerPoint presentation for arbitration. Attend arbitration as requested. Process in which parties can resolve their dispute without going to court; facilitator has no power to impose a solution. Prepare summary reports for use in mediation notebooks. Prepare PowerPoint presentation for mediation. Attend mediation as requested. Initial document in a lawsuit filed with the court; identifies allegations against defendant. Draft medical facts of complaint (plaintiff). Compare complaint to medical records (defense). Assist with defendant interviews. Serve as liaison to defendants. 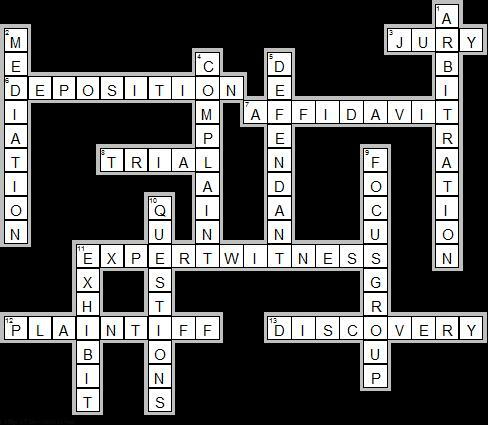 Identify and flag all chart entries of defendants, in preparation for their depositions. Coordinate focus group meetings. Assist with facilitation of focus groups. Interrogatories are written _________ to obtain written responses provided under oath. Draft interrogatories related to medical aspects of case and standards of care. A document, photograph, or object introduced as evidence during a trial. Identify key medical records and other documents. Copy those records for use as exhibits.